MotoGP GETS SERIOUS. MARQUEZ BACK ON TOP. You are here: Home › MotoGP GETS SERIOUS. MARQUEZ BACK ON TOP. 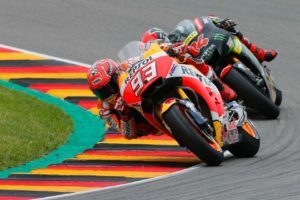 Only 6 points Separate Top 3 Riders as Marquez Wins German GP at Sachsenring. 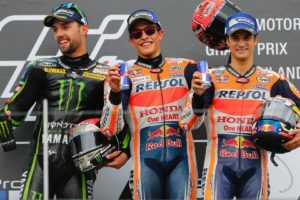 Marc Marquez on his Honda won the German GP for the eighth successive time and now leads the Series by only five points from Yamahaâ€™s Maverick Vinales. Even though the Marquez and his Honda seem to be getting more competitive every week, the race to the 2017 title is still wide open. As the World Championship Series now heads into its four-week summer break, Marquez is now sitting on 129 points overall from Vinales on 124 and Ducatiâ€™s Andrea Dovizioso on 123. Valentino Rosssi is still within striking distance of the leaders on 119 points. But it was MotoGP rookie Jonas Folger who pushed Marquez to finish a well-deserved second. It was a great career boost for the German, Folgerâ€™s home track podium performance going down well with the locals. Dani Pedrosa, Marquez’s teammate, finished a long way back in third, but added to his 103 points total. Australia’s Jack Miller finished the GP round in 15th. The next race is at Brno in the Czech Republic on August 6.
next post: Fancy Riding Across the Nullarbor Plains? Dont Leave Home Without Your Highway Pegs.